Good nutrition starts with having cupboards with healthy stuff inside. The easiest way to make sure this happens to focus on the dreaded, annoying and often downright scary supermarket shop! We have some tips for you to help make the best nutritional choices possible as well as maybe save you a bit of money along the way. No matter what, always remember that the supermarkets are designed to make you buy. As you throw in your wallet, mobile and car keys, don’t forget to take a healthy dose of cynicism with you too! Before venturing out, spend a few minutes writing a list of the things you need. Figure out what you are going to have for each breakfast, lunch and dinner and what you have already. This will save you many a calorie – if you have the food there, you are more like to eat it rather than ducking out for a hamburger at lunch or ordering takeout when home from work and exhausted. Having a list will also mean that you don’t need to venture down the isles where you don’t really need to go (chocolate isle anyone? ), saving you the temptation. This is also a great money saving tip. It means that you are not double buying things that you already have in the cupboard, over buying amounts of food and watching it rot in the fridge or on the kitchen bench or spending the extra on takeaway and lunches out. Never shop on an empty stomach. It is amazing what a grumbling tummy will put into the shopping trolley! 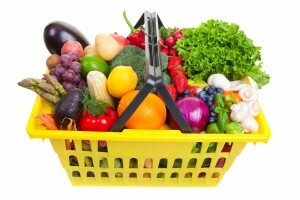 Most of the healthy options and fresh produce can be found on the perimeter of the supermarket. This is where to find the fruit and vegetables, meat, dairy products and many of the wholegrain breads. Try to spend most of your time here. Generally closer to the centre you go, the more processed the foods. As often as you can, go for the “real foods” like the 100% fruit juice or 100% wholegrain. This isn’t always an option so make the best choice possible with food with the least processing and additives. Rethink foods that have more than five ingredients, contain artificial ingredients or ingredients that you can’t pronounce. Steer clear of foods that have cartoons on the box or that are marketed to children. These will often be packed with all sorts of not great things and lashings of sugar to boot. If you don’t want the kiddies eating junk…don’t have it in the house! Buying fresh, healthy and nutritious foods does not mean spending more money. A bit of organisation and planning will go a long way, as well as using the produce on special i.e. Don’t plan to have bananas several times a week for the family at $13.00/kg when apples are cheaper! Practice, practice, practice and you will be amazed at how you shopped before. Don’t forget to experiment with different fruits and vegies to keep the family interested!